Lack of foresight and callous cadre management has landed the state Forest Department into geriatric problems. It has been burdened with aging field staff who are in no position to cope with the strenuous physical duties of protecting the vast forest wealth and the extending green cover over the denuded hills. The average age of forest guards and deputy rangers, the frontline staff responsible for protecting forests and implement the policies and programmes of the government, exceeds 50 years. The reason—there has been no direct recruitment of guards since 1992. In between some posts were filled internally by promoting Class IV employees as guards. These field workers are supposed to tread up and down the steep hill slopes to protect the open wealth from the ever-active timber mafia and keep a watch on poachers. That physical fitness is essential for the field staff is evident from the fact that during the selection of guards, the candidates are asked to clear rigorous physical tests. They are required to run 25 km within four hours besides fulfilling minimum prescribed physical standards. Each guard is assigned a forest beat, which could extend over an area of 8 to 20 sq km in rugged hill terrain. He is supposed to check illegal forest-related activities for which he has to move around the entire beat regularly. Obviously with most of the field staff on the wrong side of age, the most important task is being neglected. It is hardly surprising that cases of encroachments on forestland, illicit felling and other forest-related offices are on the rise. To make things worse, a good number of posts are vacant. There are 2,467 posts of guard in the department in all whereas only 1,849 are in position. Actually only about 1,700 guards are available to man 2,250 forest beats as some guards, mostly women, are accommodated in offices. The department has started the process to fill 447 posts through direct recruitment but it is “too little too late”. By the time the new recruits will complete training, more posts will fall vacant due to retirements and as such a substantial number of posts will remain vacant. Mr R. A. Singh, the principal chief conservator of forests, concedes that the age factor has a bearing on the functioning of the field staff. Physical exertion apart, at 50-plus an individual lacks enthusiasm and necessary agility to discharge the responsibilities. He is more occupied with family responsibilities at this stage of life. The average age of deputy rangers is 54 years. At this age, they could hardly undertake the exhausting daily drill. Forest guards are promoted as deputy rangers after putting in about 10 years of service. The situation in the wildlife wing is no better with more than 30 per cent of the total 200-odd posts of guard being vacant. Not only those, almost 50 per cent of the posts of forest ranger are also vacant. The abnormally high vacancies along with the high average age of the staff in position are severely affecting the functioning of the department. Out of the total geographical area of 55,673 sq km, 37,033 sq km area has been legally classified as forest. However, out of this about 20,020 sq km area, comprising ravines and high-altitude areas beyond tree line, is unculturable. 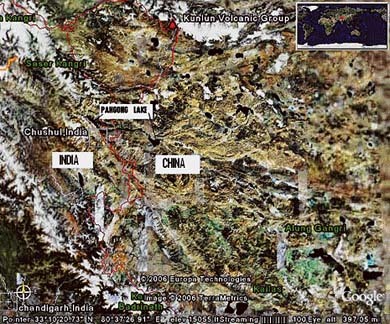 Thus the actual area under forest cover is about 17,013 sq km. The protected wildlife areas account for 12.4 per cent of the total area but there are only about 200 guards to look after it. Senior officers point out that there was no immediate solution to the aging problem. The government has to follow a long-term recruitment policy that ensures that at least 50 guards are recruited every two years. This will help correct the aberration in due course. For now the department has no option but to bear the burden of aged staff. Rare manuscripts written in Sanskrit, Tankri, Punjabi and Urdu reveal the existence of a composite culture. Thanks to the National Manuscript Mission (NMM), started by the central Ministry of Cultural Affairs, Himachal Pradesh, the Department of Art, Language and Culture (HPDALC) has dug out a rich treasure trove of centuries-old manuscripts from different parts of the state. The manuscripts show not only how and what hill people believed in and practised, but they also highlight how the hill people carried on with the intellectual pursuits that governed their daily lives. Written by the “masters” of the area, the manuscripts also highlight the central role that Brahmins play in the social and cultural life in the hills. They point out the dominance of liturgy from the time a child is born, passes through stages of adulthood, manhood and maturity to his/her last journey to the grave. Moreover, the manuscripts also highlight that the hill people from Chopal in Shimla district to Chaugan in Chamba district and from Rampur to Nurpur in Kangra district share common beliefs, faith and culture even if they live hundred of miles apart. For fear for reprisals from the police and increasing inroads made by the modern literacy and education, some households destroyed important manuscripts and literature on Tantra and other forms of knowledge. Some burnt the manuscripts and others threw them in the river, a survey reveals. These manuscripts are written in Sanskrit, Persian, Urdu, Hindi, Bhoti and Pali and other local unidentified dialects. They unveil a rich tradition of Pahari Jyotish (astrology), Ayurveda, Tantra (magic or pre-science) and other forms of “Pahari Vidya” that flourished in different parts of the state dating back to a period of over 100-400 years from now. Some of the manuscripts found in Mandi, Kulu and Shimla districts trace out the history of Devis and Devtas in the hills. A very old manuscript found at Pangna village in Karsog area mentions that Lord Rama has a sister by the name of Shanta. In a statewide survey launched under the NMM last month, the HPDALC has so far traced over 6,000 manuscripts of different antiquity and more discoveries are in the offing when surveyors send reports from all corners of the state, say the District Language Officers, who are coordinating the NMM survey in the state. 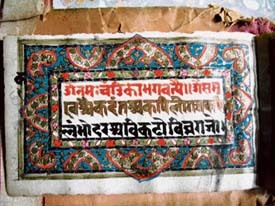 These manuscripts are written in Devnagri, Tankri, Sharda (both prevalent in the hills), Gurmukhi, Bhoti and Persian scripts on different handmade paper materials. The NMM survey has identified over 4,000 manuscripts in Mandi district, the highest in the state. In Bilaspur, it has found over 470 manuscripts, and around 300 manuscripts in Hamirpur district. So is the case with other districts in the state. The survey found that Jyotish Pandits from Shimla and Sirmaur district not only created authoritative astronomy books, but they also earned fame as great masters in the region, bringing succor to people when there was no cure for physical and psychiatric diseases. They would even solve cases of theft, crime and local disputes through what is locally called “Pahari Vidya”. The most popular system was Sancha, a book of astrology practised through “Ganana”, literally a system of mathematical calculation still practised in several areas of Shimla and Sirmaur districts. Says B.D. Sharma, a resident of Bahal village in Chopal in Shimla district, who owns the manuscript of Sancha written in Tankri: “Sant Ram, my father, was a popular Jyotish Pandit in the area. He used to teach us how to read Sancha, but none in the household learnt it. We do not know how to read the Sancha system. He would predict good or bad times for individuals in the area. He would write Jantris, book of astrology and astronomy. But this rich source of knowledge is gone with him after his death.” Tantra magic The NMM survey has found the old manuscripts of Tantra Vidya in the Karsog area in Mandi district. The manuscripts had made the district a popular place for “black magic”. Incidentally, Karsog had low literacy rate, a higher rate of poverty and prevalence of magic. “The manuscripts found in the Jogindernagar area laid down an elaborate procedure about how to practise Tantra for the welfare of people and not to harm anybody”, says Bhim Singh, District Language Officer, Mandi. “Pajayanu village in Karsog was a popular centre for the Panchang writers, who make Jantris, the Hindu astrology books”. In Hamirpur district, the survey found over 300 manuscripts. Most of these deal with Ayurveda Skand Puran, Karm Kand, liturgy, revenue records, Vedic literature, and Jyotish. The manuscripts are about 100 to 400 years old. They are written in Sanskrit, Tankri, Punjabi and Urdu revealing the existence of a composite culture. “They also tell tales of Skand Purana, Vedic Mantras and Ayurveda, says R. R. Vaid, District Language Officer, Hamirpur. Storehouse for researchers Written on locally made paper, Bhoj Patras and other material, the manuscripts are eco-friendly and the writers use only natural colours. They contain information on pre-science, magic, medicine, astronomy and astrology, art of making love and other aspects of the cultural life of the hill people, says Hindi poet and writer Dinu Kashyap whose brother late Chandramani Kashyap had preserved a rich collection of ancient manuscripts in his private art museum. The manuscripts are languishing in a room for want of a proper place at his house in Mandi. HPDALC officials say that after the survey is complete and information is compiled, they will send the manuscripts to the NMM, Ministry of Cultural Affairs. Experts will treat them and preserve them in a museum for researchers or art lovers, they add. Workshop for script learners The sad part of story is that few understand the Tankri and Sharda scripts and hence knowledge contained in these manuscripts remains more or less un-deciphered. The department, however, is conducting a training workshop at Kulu from November 6-17 for those interested in knowing the scripts so that the knowledge hidden in the manuscripts can be elucidated for the benefit of future generations. Remember the hilarious scene in Sholay where Amitabh Bachchan tries to persuade mausi to consent to Dharmender’s marriage with Hema Malini? Amitabh describes his friend’s “virtues” (like boozing, gambling, etc) with a poker face and charmingly recommends his case. If only all marriage-mediators were as truthful. An old proverb in some states, roughly translated, tells you to mediate and help in fixing a marriage “even if you have to tell a hundred lies”. Those days, the middlemen, some of them professional match-fixers, did every thing—from tallying horoscopes, right up to finalising the “give-and-take”. They were also tactful trouble-shooters when tempers rose and quarrels occurred (inevitably) during the ceremonies. A middleman was known in Sanskrit as madhya-varti (mediator)—it sounds more respectable than terms like broker, etc. Of course not all these “marriage professionals” were respectable. They were adept at hiding the weaknesses of one party from the other—that’s where the proverb I have mentioned above came in handy. Generous gifts and fees were received in return for telling lies or hiding truths. The middleman would either make himself scarce after the lies were exposed— or would face them brazenly with counter-accusations, warped logic and arguments. Often, scholarship came in handy for quoting scriptures and wickedly interpreting them to advantage. Friends and relatives have been facilitating rishtey (alliances) in Himachal— more than professional middlemen. Since demands like dowry hardly prevail among the simple rural communities, the middlemen have generally played a limited role. But of late, rapid urbanisation and growing migration to plains in search of prosperity have made match finding difficult. Apart from giving matrimonial ads in trusted papers like The Tribune, anxious parents have started visiting marriage bureaus. An element of untruth, I am told, has also crept into response to parental inquiries about the other parties. Exaggerating the groom’s qualifications, salary, prospects of inheritance, etc are becoming common. Similarly, hiding a girl’s illness and other problems are also becoming common. It is indeed difficult to verify facts in such matters, without offending the other party’s pride. 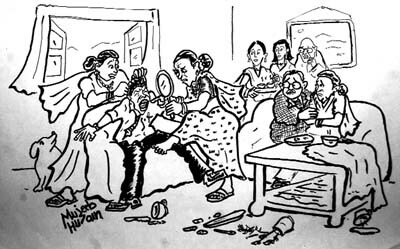 In the South and Bengal, relatives accompanying the boy used to check the girl physically for any deformity. In my teens I once saw the boy’s aunties examining the feet, hands, and even fingernails of my cousin—they pulled her hair to see if it was a wig! She was interviewed rudely, asked to sing and was made to walk up and down. Such things were common those days. In this zamana of Internet marriages, The Independent reported a new dimension recently. Listed as the “world’s most expensive” in the Guinness Book of World Records, a leading matchmaking agency in Los Angles was sued for “psychological damage and distress”. The agency had promised to introduce to its client, a sixty-year-old widow, to well-heeled and “extremely successful, kind, down-to earth romantics”. But she was hooked up with “unsuitable” gentlemen over three years. One suitor, she alleged, was presented to her as an international banker—but he turned out to be an interpreter working in a bank! The agency of course contended that she was just a “serial matchmaker suer” who wanted both fun and money. The court awarded her $ 2.1 million as damages. So, beware, those of you eager to bring yearning hearts together! This is also the zamana of new-fangled litigations. Interestingly, five matrimonial agencies have come up recently in Beijing with a “love messenger service”. China Daily reports the case of Larry Wang, a shy youth tortured by his secret love for a girl but who lacked the guts to propose. An agency compiled Mr Wang’s sweet confession on a CD and presented it to the lady along with a bouquet of roses. “She was moved to tears”, the happy gentleman said, “and accepted me as her boy-friend”. Another 20 such agencies are expected to come up there in view of the growing demand. A survey suggests that many young ones are shy and “have difficulty expressing their love… that too properly, and always regret when they miss the chance”. It was a week of political rallies in the state as the Akhil Bharatiya Vidyarthi Parishad (ABVP) and the Students Federation of India (SFI) held massive rallies against the education policies being pursued by the government. The Congress put up its show of strength at Dharamsala where the AICC chief and UPA chairperson, Mrs Sonia Gandhi, made an appearance. The rally addressed by Mrs Gandhi was impressive but her remarks about a possible feeling of discrimination among the people of Kangra left a bitter taste in the mouth of the state leadership. The Chief Minister, Mr Virbhadra Singh, said Mrs Gandhi’s remarks had been misquoted and there was no question of discrimination with the people of the largest and politically significant district of the state. The ABVP show was impressive as over 10,000 students from all over the state turned up at the rally against privatisation and commercialisation of education. The venue of the rally, the ice-skating rink, was packed to capacity and some of the students, including the all-India general secretary, K.N. Raghunanadan, did not find place inside. The state-level rally by the SFI saw a student contingent (jatha) leave for Kolkata. The jatha will reach Kolkata on December 11 and will hold 100 rallies and collect signatures of one crore students en route. Mr Nilotpal Basu, MP and Member, Central Committee, addressed the CPM rally. The rally had been organised to protest against dividing students along communal lines in the name of reservation. The speakers demanded constitution of a national education commission to spell out an education policy. Having emerged as the winner during the first Dr Y.S. Parmar championship in the men’s division, 16-year-old Shiv Bhatnagar appears to be a golf prodigy in the making. He also happens to be the captain of the golf team of DPS, R.K. Puram. This was Shiv’s second great win at Naldehra as last year, too, he had clinched the 2006 Naldehra Open Golf Tournament. He won the Dr Y.S Parmar trophy with a card of two over on day one and two under par on the second day. He finished level par for the tournament. He was declared the winner with 27 points and with a handicap of six. “Without coach Romit Bose’s guidance, family support and Ravi uncle’s help, I could not have achieved such heights,” said Shiv. Being just 16 years, he has created history by winning the first Dr Y.S. Parmar Championship in the men’s division. Col N. Kapoor won the second prize with 26 points. Another budding golfer, Paras Sethi (16) played his first tournament at Naldehra, emerging amongst the top ranks. Notwithstanding the fact that he had never played at Naldehra before or practiced, he played a lovely three over par on both days of the tournament. The organisational elections of the BJP in the state have brought to the fore the dissensions and bickering, showing once again that the main Opposition party in the state is split into Shanta and Dhumal factions. Interestingly, a third faction owing allegiance to the state BJP chief, Mr Suresh Bhardwaj, has also come into being. The run-up to the election of the state chief of the BJP has seen so much of infighting that even senior leaders like Mr Roop Dass Kashyap, Mr Vipin Parmar and Mr Satpal Satti besides others have been accused of acting in a partisan manner. Interestingly, Mr Parmar, former MLA from Sulah Assembly segment of Kangra district was even issued a warning by the state BJP chief, Mr Bhardwaj, for disobeying the directives of the State Election Officer, Mr Ashok Sood. Mr Parmar was the District Returning (DRO) for conducting elections in Solan district. To preserve the essence of the ancient glory of the Brijeshwari Devi, Jwalaji and Chamunda Devi temples, these ancient shrines are being refurbished with gold-coated domes and layers of silver on the inner walls to give them a fresh look. The district administration is also adding a host of public convenience features at these temple shrines. Deputy Commissioner Bharat Khera told Himachal Plus that after making a master plan for the three temples, professional architects from Rajasthan had been hired to plan out the look of the temples for the next two decades. The project at these ancient shrines had been undertaken with the help of generous donations by the devotees. The five domes of the Jwalaji temple were being gold-plated at a cost of Rs 2 crore and the Shaiyya Bhawan, where the idol of the Goddess retires for the night, was also being done up. Artistes from Rajasthan were busy making hand paintings on the interior walls, which were in keeping with the original style used in the temple, says the Mr Khera. Similarly, the coating of silver on the inner walls of Chamunda Devi temple was almost complete. The flooring was being replaced with marble and the lake on the temple premises was also being beautified. The Brijeshwari temple, parts of which had been destroyed in the major earthquake that rocked Dharamsala in 1905 along with the eight small temples inside its main compound, was also being re-furbished. The attempt was to make them gel with the architecture of the temple. “Many gaps had come up in the temple architecture following the earthquake as the restoration work was later done only in parts. The master plan would make sure that the temple’s development is planned in totality,” says the Deputy Commissioner. A road was also being laid up to the Brijeshwari temple and the entire area was being lit up with overhead lighting. A gate was also being constructed at the Tehsil Chowk to make the temple entry more prominent. Close-circuit cameras had been recently put up in the three temples for security reasons. 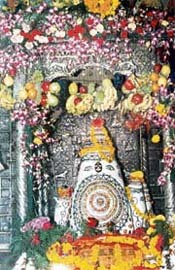 A plasma TV had also been installed in each temple so that devotees could view the Aarti ceremony.The district administration was also setting up tourist reception centres in the temples, which would sell the offerings made to the Goddess so that the devotees returned with a memorabilia of the temple. Souvenir counters would also be added so that tourists got information about other key temples in the area. Finding a solution to the demand for water of the Indian Army at various locations between Kargil and Siachen glacier has been no mean task but thanks to the ingenuity of a young geologist and his team, the soldiers no longer have to toil to get water in sub-zero temperatures as bore wells have been dug all along the route. Accomplishing this arduous task has brought laurels to Kasauli-based Ritesh Arya, who has broken his own earlier world record of drilling an artisan bore well at a height of 14,262 feet at Chusul on the India-China border, close to Tibetan territory. His name was listed in Guinness Book of World Records for drilling an artisan bore well near Zoravar Fort near Leh, located at a height of 11,300 feet in 2004. He has now written to the Limca and Guinness Book of World Records to verify his claim and put a new record against his name. “Instead of making use of satellite imaging and other modern equipment, we believe in practising traditional knowledge,” says Arya. Though he has drilled a bore well even at a height of 15,500 feet at North Polo but that was not an artisan pump as a pump had to be used. He says with his theory he has tried to change the notion that there is no groundwater on the hills, which is the main factor behind the government spending crores on lift-water schemes. “If we have successfully drilled bore wells in sub-zero temperatures on Siachen glacier, I feel that there should be no difficulty in having these wells at various places in Himachal as well,” he remarks. Arya’s experimentation with drilling bore wells started as a challenge which came his way when he was asked by Water Aid, a charitable organisation run by the Queen of England to explore the possibility of providing water to the Tibetan refugee population residing at Choglunsar in Leh. He says he took it as a challenge and succeeded in addressing the problem faced by the 10,000exiled population that was given land by the Indian Government in Leh after they fled from Tibet in 1959. Later he was approached by the Indian Army to provide a solution to the water problem faced by the men deployed in difficult areas along the Chinese border. “During a large part of the year, the snow is frozen and the soldiers had to melt it to meet their water requirement. So I was approached by the authorities to work out a way so that there could be ready availability of water,” he said. In 2002 Arya and his team solved a major problem faced by the Indian Army when they drilled an artisan bore well, which till date is operating successfully at Chusul, where a memorial dedicated to the martyrs of the 1962 India-China war has been erected. Arya says that the state government instead of pumping in crores of rupees on lift water supply schemes should tap the immense groundwater potential in the hills. “We must not forget that springs are a manifestation of groundwater and all old habitations in the hills are concentrated around them,” he explains. Having served in the state government as a hydrologist for a brief period, he had placed a proposal before the authorities to drill artisan bore wells on a ‘no water-no money’ basis, which was surprisingly rejected. He still feels that a detailed study about groundwater and its harvesting should be conducted as this can pave the way for the setting up of cost-effective water schemes and addressing a major problem faced by the people in the hills. It’s time people learn to fight for their rights and according to Dr K.R. Arya, people can be sensitised through a sustained campaign. It’s all the more relevant for the people living in remote areas which still far away from development. Dr Arya is doing just that. To make the downtrodden section aware of their rights and also to how to go about it, he is planning to publish with a newspaper. “The mode I have chosen for spreading awareness among the poor and also to seek their direct feed back, is a monthly 16-page Newspaper in Hindi called Garib Ki Awaz which will be launched next month,” says Dr Arya, Dr Arya is based in Mehatpur in Una and is the Editor-in-Chief of the proposed newspaper. “If we get good response then we would publish it twice a month,” he adds. “We will also address issues like legal rights, employment and education programmess,” he says. Dr Arya feels that development is not possible unless the people at the grass root level are involved. He says Dalits, in many areas, are still not aware of the their rights and hence fail to get the benefits from various schemes meant for them. “We want to highlight the environmental issues which directly affect the life of people,” he adds. Problems for the country’s largest private venture in hydroelectric power generation, Rs. 7,760-crore 1000-MW Karcham-Wangtoo Hydroelectric Power Project, proposed to be set-up by the Jaypee group of companies in Kinnaur, are not over. Even as the power-sector giant has almost completed construction work on the diversion tunnel but the tribal unrest against this project has so far not allowed the company to begin work on the main tunnel, dam and power house of the project. Ever since, the company was awarded the contract on a built-own-operate basis in the year 1999, the issues related to its impact on environment of the area raised by the local people and the gram sabhas continue to pull the plug on this mega hydroelectricity project. The biggest hurdle that has come on the way of this mega project is the amended Himachal Pradesh Transfer of Land (Regulation) Act-1968 that makes it mandatory for the private investors to get prior consent of the gram sabhas concerned before seeking clearances from the required departments of the state government to initiate work on the project. The gram sabhas of the affected villages of Miroo, Yula, Urni, Chagaon, Panvi, Kilba, Poonang and Brua had so far not given approval to this project. Besides this, the Zila Parishad of Kinnaur has also passed a resolution against the project. The local people of the affected villages say the main tunnel of this project would pass beneath their villages. Intense blasting for construction of this tunnel would lose the rock strata posing danger to the very existence of these villages, the tribal people allege. They further allege that the sources of water in the affected villages would get dry with the construction of this tunnel. Under such circumstances, people would have to suffer a lot and may even have to migrate to other places. They also say this report is silent on disaster management plan in case of any natural hazard. They are of the view that the company should prepare a comprehensive disaster management plan keeping in view of the recent incidents of flash floods in Sutlej River. Ranjit Singh Negi, a bureaucrat-turned environmentalist while rejecting the environmental impact assessment study says that it generally seems to be shoddy and biased piece of work done to favour the project proponents. The source of most of the information in the study is the report of the project proponents and no attempt seems to have been made to verify or cross check the information, he claims. Sutlej River is already heavily dammed with many power projects. The 300 MW Baspa-II Hydroelectric Power Project on Baspa rivulet upstream of the proposed Karcham-Wangtoo Hydroelectric Power Project, the 1500 MW Nathpa Jhakri Hydroelectric Power Project downstream of the proposed project, the 120 MW Sanjay Vidyut Pariyojana on Bhab river a right bank tributary of Sutlej just upstream of Nathpa and the most celebrated dam Bhakra dam downstream of Bhakra are the major dams on Sutlej. The 1020 MW Khab-Shasho Hydroelectric Power Project has also been proposed on Sutlej upstream of Karcham-Wangtoo Hydroelectric Power Project. The study has failed to look at the cumulative impact of all these dams on the river and the adjoining area with regard to its carrying capacity, reservoir induced seismic activity, disaster management plan and flood risk management. The study does not include a proper disaster management plan. At one place the report just mentions that disaster management plan is not required for running the river project, which is not true and is not supported by any legal opinion. In fact, a government of India notification by the Ministry of Environment and forests has made the disaster management plan mandatory for all such projects. In the report, the company has made a provision of Rs 1.18 crores for some items- “warning system in case of dam breaks” as part of “cost for environmental management and monitoring”. But, without full dam break analysis this is of little meaning. It is also a hard fact that in the non-monsoon periods the water flow in the river decreases drastically. The power production in Nathpa-Jhakri Hydropower Project declines due to this problem during the winter season, every year. The environmental impact assessment study does not assess or mention the need for minimum requirement of water flow to run the power project in full capacity. Therefore, it will also have adverse impact on the power benefits from this project. There are also some doubts among the tribal people on the stability of the dam. Debris accumulation and landslides are very common in the area on both banks of the Sutlej river. The change in climatic conditions with the coming of the dam would add to the instability and possibilities of more landslides into the reservoir. The environmental impact assessment study does not mention about the landslide incident at Urni village that had once blocked the path of the river in the past. Increased activities on the road had also destabilized the surrounding slopes. Neither, there is any mention of the cloudbursts in the environmental impact assessment study. Cloudbursts are very common experiences in Kinnaur during the monsoons. However, it does not draw out the implications of this, nor does it mention the impact of this on the project and its surrounding areas. Further, the environmental impact assessment study has underestimated the significance of seismic factor in the area. Undoubtedly, the region has been an active seismic zone having experienced an earthquake of up to magnitude 8.0 on Ritcher scale. The height of the proposed dam according to engineering geology is 90 m but actually if taken from the deepest foundation the level is 98 m. This raises doubts on the assessment of engineering geology. The recommendations of engineering geology on page 6.31 and in Annex 4.1 of the environmental impact assessment study includes suggestions of further exploration to be done before the construction is started. Again on page 6.31 it is mentioned, “It is desirable to carry out dynamic analysis for the final design in order to estimate deformations due to probable future earthquakes”. This clearly means that the environmental impact assessment study on this aspect too is incomplete and as such it should not have given a go ahead to the project. The study does not even mention that the villages of Kinnaur being under scheduled areas, no decision could be taken without the affected villages giving their consent through gram sabha decisions and that no gram sabha can take a decision unless they are told about full impacts of the project. The debris generated during road construction will be used for filling and leveling the road surface. The extra material which remains unutilized may roll down along the slope and gets accumulated on slopes. This in turn is likely to damage the flora along the slopes. Should this practice of allowing the excess debris to roll down the slopes be accepted in fragile, land slide prone areas? The uncritical acceptance by the environmental impact assessment agency of this environmentally damaging practice of the project proponent again shows the callousness of the agency and its bias in favour of the project proponent. Keeping in view these issues raised by the local tribal people, Vinay Negi, a local environmentalist who is actively opposing this power project says that there is a need for a certain course correction and the state government requires concrete steps, rather than allowing the company blindlyto go ahead with the project. Rich in natural resources, the Salooni development block in Chamba district is one of the most backward districts of the country. A majority of people in the block are still living below the poverty line. Statistics show that 67 per cent of the population lives below the poverty line. The area has not been able to develop despite the fact that the land is fertile and most suitable for cultivation of high-value cash crops. To alleviate poverty in the area, the state government had drawn up an ambitious scheme called Rashtriya Sam Vikas Yojna, which was implemented in June 2004 to boost the economy of the area. The people of this area are being encouraged to grow cash crops and off-season vegetables. The scheme is progressively ameliorating the living conditions of the local farmers. Before the implementation of the scheme, there were hardly 110 self-help groups. Now 300 such groups have come up within a year, out of which 210 groups have opted for the cultivation of off-season vegetables. About 20 active members of different groups in panchayats were selected as facilitators and then 20 facilitators were trained in the cultivation of off-season vegetables and formation of self-help groups, which are responsible for carrying the message from block to the grassroots level in villages and hamlets. To facilitate marketing of vegetable crops, a block-level samiti of these groups was also formed. Each group was asked to join in these samitis registered as Green Gold Krishak Samiti Salooni (GARIMA). Implementation of the scheme began in June 2004 and after two years its visible impact on the life of the rural people in the Salooni block can be seen. The impact is multifarious—increase in SHGs, development of leadership quality and political awareness, women empowerment, self-employment, desisting from illegal activities, drop in immigration, increase in utilisation of hybrid seed of tomato, cabbage, cucumber, cauliflower, beans hybrid, increase in the area under cultivation of off-season vegetables and re-cultivation on abandoned land. Mohummed Abbas of Akunja village, Sakina, a member of Jagriti, Hussain Mohummed of Modi village, Prahlad and Kanth of Suri panchayat, Khem Raj of Diur panchayat, Birju Ram of Mauda panchayat and many other farmers have prospered by cultivating and selling off-season vegetables. Mr Rehmatulla, a member of SHG Sieul, is an example of how these self-help groups are bringing happiness to the lives of the downtrodden and especially farmers in this development block. A poor man with smallholdings, Rehmatullah, has succeeded in earning Rs 22,000 by planting 500 tomato plants in his five biswa land last year. Erected by the art-loving King Varman (920-940 A.D.) during the 10th century, Chamba is a ‘town of temples’. The ancient temples in Chamba are more numerous and were hitherto better preserved than in most place in the northern region of the country. These temples are of two distinct types — imposed parasol for draining off snow as in Kedarnath and Badrinath temples. The Vishnu temples belong to the “shikhara’ type while shrines dedicated to Devi or Naga represent the indigenous ones signifying the original cult of the hills. The temple of Obdi Shivdawala of hill temples architecture in this part of the region. The temple located near a spring along the left bank of the river Ravi, was built in the memory of Wazir Bagha who was a contemporary of Maharaja Ranjit Singh. It is raised on a high plinth and is accessible by steps. The Paintings adorning the outer walls represent the Chamba type of the early 19th century. The wall paintings Obdi Shivdwala are the only ones left in Chamba. The 1000-year-pld temples like Lakshmi Narayan, Hari Rai, Bansi Gopal, Sita Ram, Brijeshwari, Chamunda and Bhagavati Champavati which are richly carved and tastefully engraved, throw light on Chamba’s glorious past. The distinction and splendour of the Lakshmi Narayan temples are the most attractive and remarkable. Estabished by King Sahila Varman, the Lakshmi Narayan temples are locate near the Akhanchandi Palace in the town. Although they are dedicated to different delties yet these temples by virtue of being ancient are great attractions to art-lovers, historians,pilgrims and touris. The complex comprises of a cluster of six temples which from the north to the south are Lakshmi Narayan, Radha Krishna, Chander Gupt, Gauri Shankar,Trayambakayshwaar and Lakshmi Damodar. The three main temples — Lakshmi Narayan, Radha Krishna and Lakshmir Damodar — are dedicated to Vishnu while the other three temples — Chander Gupt, Gauri Shankar and Trayambakayshwar — are dedicated to Shiva. The other temples situated in the precincts of the complex are dedicated to Shiva, Vishnu, Mahakali and Hanuman which are of great archaelogical interest and historical significance. 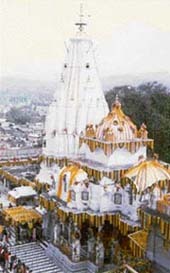 The ‘samadhi’ of Sidh Baba Charpat Nath is located between the Lakshmi Narayan and Radha Krishna temples. Baba Charpat Nath, a sage during the rule of King Sahila Varman, played a key role in administering the state. The king had always sought the Baba’s advice whenever in difficulty. The absence of a railway link is a major hindrance in setting up an inland container depot (ICD) at Baddi. The opening of this depot would have relieved the industry from the recurring problem of shortage of trucks, AC containers and specially designed vehicles for transporting their finished goods. The railways has no plan of expansion but for only a container freight station (CFS) which is to come up in the industrial area. The government has invited interested parties for setting up a container depot at Baddi. The three parties have already offered to set up a freight station. In addition to this, the Container Corporation of India has offered to set up a CFS, which will later be upgraded to an ICD if a railway link is to be established in the near future. A CFS will cost about Rs 7 to Rs 10 crore whereas an ICD will require an investment of about Rs 40 crore. With industrial units coming to this region, shortage of trucks is being increasingly felt. Though the local truck unions have enhanced their fleet from the existing 1,600 to 2,300, but the number is still not adequate. The lack of containers in the area has affected the export-oriented units. With no containers, the units are forced to transport their goods in open trucks covered with tarpaulin. Besides, it is the charges by the local unions, which creates more problems for the units. According to an estimate, the freight charged in this region enhances a product value by 3-4 per cent. The monopoly of these unions dissuades any unit to hire trucks from outside. Earlier, two trucks of a chemical unit in Sirmaur were burnt down when they refused to comply with the demands of the local unions. Similarly, Gujarat Ambuja Cement Limited (GACL) too had to face the brunt of repeated strikes for the failure of the unit to enhance freight charges early this year. 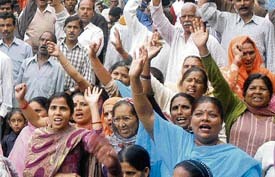 The strike, which lasted more than two weeks, caused revenue loss worth crores. The lack of containers also affects the transportation of pharmaceutical units. “The non-availability of air-conditioned containers adversely affects transportation of injections, capsules and other drugs which require to be kept under specific temperature. Since the containers have special conditions for maintaining temperature as per their requirements they are deemed fit for the pharmaceutical units,” confides a senior manager of Cipla Pharmaceuticals Limited. The much-hyped opening of the Inland Container Depot has hit a major roadblock with the absence of a railway track in the region. Despite pursuing the matter since several years with the Union Railways Ministry, little has been achieved. The ministry had announced to conduct a survey in the 2003 Central Railways Budget. Even after the survey, no funds were earmarked for its execution. This has come as a major set back to the investors. Even the Container Corporation of India had to withdraw its plan to open an inland container depot in the absence of a railway link.